Ein Zimmer ohne AC ist nicht zu empfehlen, da es in dem Zimmer kein Fenster gab und somit trotz Ventilator viel zu heiß war. Freundliches Personal und sauberes Zimmer ! 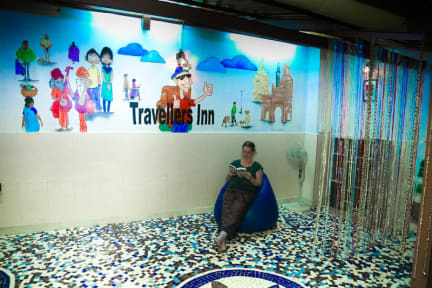 The Travellers Inn is a great hostel. We stayed here the first 2 nights, after arriving in India. The stuff was so helpful and arranged train tickets for us. They had such a positive attitude and it was Always fun to talk to them. The rooms were very clean and the roof terrace was a good place to hang out. I would always come back. We stayed in a double room. It was nice with bathroom, though the toilet didn't flush really well. But even double rooms are equipped with lockers which is good. Staff wasn't really helpful. Rooftop was nice. Its about 15mins walk to gateway of india. Das Zimmer war sauber und geraeumig. Auf der Dachterasse gibt es Fruehstueck und Trinkwasser zum auffuellen. Das Personal kann allerdings noch sehr an sich arbeiten! Stoert aber nicht weiter...fuer die Lage und den Preis jeder Zeit wieder dort hin! Locker wasn't working. Staff was partly unfriendly (except of the guy at reception and the younger staff). Sad athmosphere. Good location. Says 24h reception but I had to wake up the staff to get in. There are signs hanging around about computers and gym equipment but nothing of that can be used. I guess it was a pretty good hostel at some point and with a little bit of love it can be like that again. Wir erwarteten internationale Gäste, mit denen man sich beim Frühstück austauschen kann, dazu zumindest eine Mikrowelle und Wasserkocher. Leider wurden die Erwartungen sehr enttäuscht - kaum internationale Reisende, das Frühstück bestellte man aufs Zimmer. Beim Frühstück konnte man sich zwischen ein paar Snacks entscheiden, die auf der Straße überall für 12 Rupien verkauft wurden (ca 15 cent). Die Klospülung tropfte durchgehend auf die Klobrille. Die Dusche tröpfelte nur. Better find another place, I can not recommend this hotel. 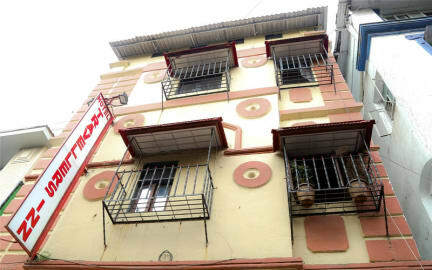 Rooms were dirty (some had bed bugs), facilities like hot water and AC were not working (sometimes no water at all). There's a night club directly under the hotel and it is very loud until 1am. The staff members were extremely unfriendly and didn't seem interested in the wishes of guests at all. Not worth the money!